It’s no accident that unoccupied classrooms and offices are darker this semester. This is a good thing, according to Syracuse University’s Sustainability Division, because it means that more people are noticing and acting on the hundreds of additional “Lights Out” stickers that went up above light switches over the summer. Using less electricity directly reduces SU’s carbon footprint and is an important step toward helping the University implement its Climate Action Plan, which is the roadmap for SU to become climate neutral by 2040. 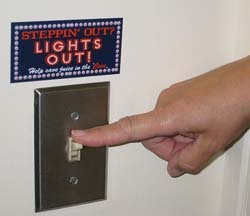 “Lights Out” stickers were placed throughout buildings last semester with the help of student volunteers. Sustainability Division staff members and Berg worked throughout the summer to place the stickers in more North Campus buildings, primarily those surrounding the Quad. While putting up the stickers, Sustainability Division staff noted that many people were already in the habit of shutting lights off before leaving a space and working under natural day lighting from their windows. Students interested in volunteering to help place “Lights Out” stickers in campus buildings can contact SU’s Sustainability Division at sustain@syr.edu or 443-9820.